I am delighted to say that Sarah Madison’s new book is now available. Sarah and I are members of the same critique group, so I had the jump on you all here – I’ve read and loved this book ever since she sent us the first few chapters. It’s a great, great book. Eight years ago, Jake Stanford had it all: a spot on the U.S. Olympic Equestrian Team and the love of his life, Rich Evans. A tragic accident wipes out everything in the blink of an eye. Hard work and sacrifice get him another shot at Olympic Gold, but only if he puts his past behind him and agrees to work with Rich again. Bound by secrets he cannot share, Rich was forced to give up Jake eight years ago. Now he has a second chance to help Jake realize his dreams. But the secrets that drove them apart haven’t changed, and Rich must face them or risk losing Jake forever. I hold my hand up to an interest here – I’m a member of Sarah Madison’s crit group, so I’ve had the very great pleasure of reading this book as it was written and developed, and let me tell you, you have a treat in store. Sarah Madison knows horses. 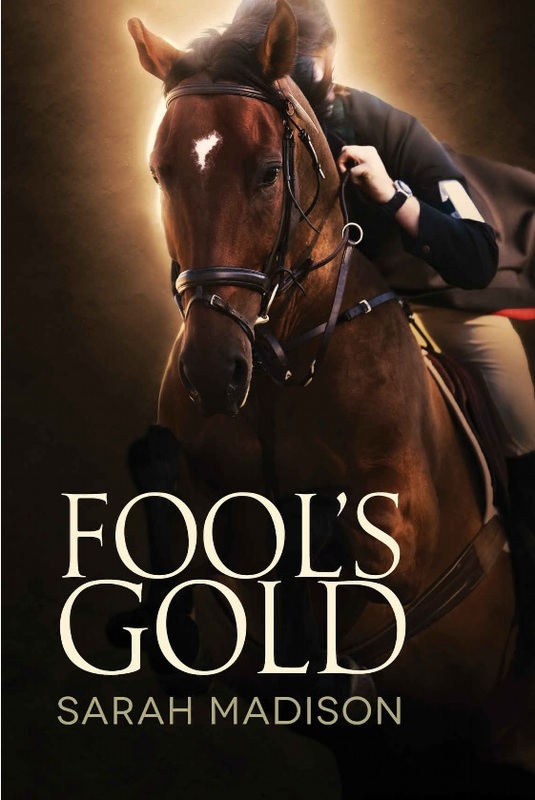 She knows competitive horse riding, and all the knowledge and expertise, not to mention her love for horses, deepens and colours one of the most engaging stories of love lost and regained that I’ve read in a long time. I won’t repeat the plot here, but will say that this novel has everything you could look for: two rather damaged main characters (one physically, one emotionally) who were parted by the fall out from a terrible accident – and the machinations of the father of one of them – and who only reunite out of dire necessity; and by doing so find an unexpected peace and happiness. Sarah, I’ve found, doesn’t write ‘easy’ characters. They often have some real, hard issues to deal with en route to an understanding with each other. Jake and Rich are no exception. Both feel used, betrayed, belittled. They have some quite serious baggage to clear, not least a distrust of each other, before they can reconnect to find that what they’d had eight years earlier, is even stronger now. And it all ends on a very topical note, with the Rio Olympics. Perfect timing for this book. Thoroughly recommended. If you like books where the worldbuilding and scene-setting have the unmistakable ring of authenticity, if you like complex characters who are imperfect and have their scars to deal with, if you like a love story with a satisfying end – well, then. You’ll like this.
. Sarah Madison is a writer with a little dog, a large dog, an even bigger horse, too many cats, and a very patient boyfriend. An amateur photographer and a former competitor in the horse sport known as eventing, when she’s not out hiking with the dogs or down at the stables, she’s at the laptop working on her next story. When she’s in the middle of a chapter, she relies on the smoke detector to tell her dinner is ready. She writes because it’s cheaper than therapy. Sarah Madison was a finalist in the 2013 and 2015 Rainbow Awards. The Boys of Summer won Best M/M Romance in the 2013 PRG Reviewer’s Choice Awards. The Sixth Sense series was voted 2nd place in the 2014 PRG Reviewer’s Choice Awards for Best M/M Mystery series, and 3rd place in the 2105 PGR Reviewer’s Choice Awards for Best M/M Paranormal/Urban Fantasy series. If you want to make her day, e-mail her and tell you how much you like her stories. Goodness, you humble me, Anna, with such kind words! And I *adore* the way you put this post together–aren’t the chapter headers lovely? 😀 You’re really started off my day with a big smile. Thank you so very much! Absolutely honest review – I love your work and this book is a cracker. I hoped you wouldn’t mind/would like the headers! It was a bit cheeky to pinch them, but they are so good!